The museum’s regular hours of operations vary throughout the year. From time to time, special events are organized on the museum grounds occurring at different times than the regular hours of general admission. If you have questions, please call the museum, at 815-397-9112. Museum Center, Mill House, Old Dolls’ House and Museum Store. Village open by appointment only September through April. The last tour of the day begins at 3 pm. Admission cost varies on Special Event days. A group consisting of 10 or more visitors with advance reservations receive $1 off each admission. * Free/Donation Days is for State of Illinois residents only. 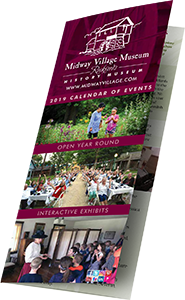 From 9am to sunset, when there are no public or private events scheduled guests are encouraged to use of the public park areas of Midway Village Museum which are the areas near Lake Severin and the Millhouse. When museum special events or private rentals are scheduled the public is directed to gather for their use on the far north side of the Millhouse nearest to Guilford Road. Guests should park in the Rec Path parking lot. There is no fee charged. Guests wanting to take a tour or group photos inside the Victorian Village may do so during regular operating hours with paid admissions for all guests in your group. The Victorian Village is open seasonally May through August. See hours listed above. Further questions? Call 815-397-9112, ext. 114. Thank you. There are no ATMs available on the museum campus. No Pets are allowed on the museum grounds. Only On-Duty Service Dogs Allowed. Also no Drone Photography is permitted. Alcohol and weapons of any kind are not permitted inside the event. For your security belongings will be subject to inspection. Call 815-397-9112 for information on an accessible wheelchair and to make a reservation for use during your visit. Midway Village Museum is an entirely smoke free campus beginning Thursday, June 1, 2017. The museum must abide by the Rockford Park District Code of Ordinances to ban smoking entirely from its facilities and parks. Midway Village Museum is property owned by the Rockford Park District, therefore is forced to follow the Park District’s rulings. The smoking ban makes the entire museum campus, including its Victorian Village and buildings, the Main Museum Center, open park spaces, and parking lots all smoke free areas in accordance with the smoking ban. Midway Village Museum must abide by all Code of Ordinances of the Rockford Park District but does not vote on these codes. The Rockford Park District Park Police will be enforcing the smoking ban on the museum campus. If you have further questions or need to contact the Rockford Park District, call 815-987-8800. To learn more about the smoking ordinance, you may also visit the Rockford Park District website link: http://rockfordparkdistrict.org/events/news-blog/331-rockford-park-district-strengthens-smoking-ordinance-in-an-effort-to-improve-community-health.